The spiritual concept of the positive self-fulfilling prophesy, which represents things like prayer and faith, is pivotal for message receiver and arguably for anyone dealing with trauma. As many people I have worked with have pointed out, the concept is present in the Bible and, I believe, in other spiritual traditions from the major world religions to the local indigenous practices. Whether this is true or not, I’d argue that the concept of positive self-fulfilling prophesy is also clearly present in modern music (I heard it in a John Mellencamp song) in self-help books (“The Law of Attraction,”) modern spiritual videos (“The Secret,”) and in the foundations of positive psychology. I am essentially arguing that this is a major cultural phenomenon that message receivers are simply denied in the current system due to labels and prejudice which they ever so desperately need! I argue that the institution and wider culture fail to teach it to message receivers when it is so particularly needed in message crisis. Indeed, somehow social goals associated with self-fulfilling prophesy get permanently dropped when they need to be first and foremost on the helper and messages receiver’s mind. It is hard when someone is locked in a warehouse with nothing to do to teach such a concept. Still, some recovery minded helpers manage to help message receivers focus on activities in some stark circumstances. To demonstrate what message receivers lack in captivity, I am going to initiate a sports analogy that demonstrates ways the positive self-fulfilling prophesy is widely taught to children in society. In sports, positive messages “I am going to win” lead to a sense of power and agency in the world and often become premonitions. Of course, it might not always work, but when brash predictions occur and come true, time and time again it becomes folklore. Think of Babe Ruth pointing to the bleachers, Muhammad Ali becoming a “I am the greatest. . . a bad, bad man,” Joe Namath leading the underdog Jets to victory against the Raiders, and gold medalist downhill skier Bill Johnson. All these sports heroes brashly predicted their future success and then made it come true. Of course, there are historical examples of some such predictions that didn’t quite work out, but that’s OK they will probably get forgotten. This does not disrupt the ethos of the positive self-fulfilling prophesy towards sports that is needed to succeed and achieve. Consider how sport legends are used to inspire kids to develop agency in their own lives and practice their sport for their health until most come to the realization that they aren’t gifted enough to go professional. Self-fulfilling messages lead to self-actualization and optimal health and are part of all of our efforts to survive. There are, of course, many that want to be the greatest who can’t be. The work becomes to accompany to positively motivated person in accomplishing their mission, rather than telling them it is not possible. Encourage the journey towards greatness and a niche where the individual can survive in a humble manner with their need met, using their strengths to have a meaning and purpose. Indeed, a helper needs to help the positively motivated message receiver to create their niche without attacking their message guided positive self-fulfilling prophesy. A reality check that says, “No, you are not the greatest, your messages are wrong” can do an awful lot of damage and undo the mechanism of the self-fulfilling prophesy subduing it with a rapid tranq. Learning that this is just and necessary can do a lot to kill that needed positive self-fulfilling prophesy. In a corrupt world of potential cultural barriers, getting positive feedback from messages can be a feather in anyone’s cap. And listening and collaborating with positive messages be they voices, intuitions, or linguistic coincidences needs not be cut off; but managed by focusing on survival needs and setting up goals that can take care of additional wants. Particularly with those who are spiritually motivated, teaching humility and guiding the person towards actualizing their greatness as it is meant to be is doable. It is better to believe in a body’s god given greatness. Helpers who confront it and overpower it teach a body not to listen to special messages, to deny that they exist, may well help pave the way towards institutionalization. Last chapter we have examined how the reverse of the positive self-fulfilling prophesy, the trickster often leads to an increased dependence on messages. Ultimately I will argue that message receivers need to choose a positive mindset and choose to do so repeatedly to regain focus off the spiritual message world and battle to hang in accomplishing material world achievements. Much like brash sports legends who predict their future success guide the multitudes in motivation, tricksters have a parallel process. Hence, miraculous trickster realities inspire reliance on the truth of the message experience. Consider how when tricksters come true in a miraculous way, it can make the message receiver rush to judgement about the accuracy of all messages. 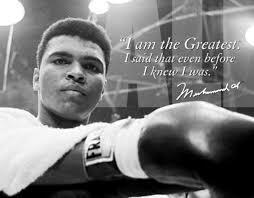 Message receivers become like a classroom full of Muhammad Ali children all saying their spirit world is the greatest. In reality, each individual classmate, in setting social goals, needs to take into account their natural skills and inclinations and work to be the greatest in something apart from their spiritual world that is really in line with god’s mission for them. In the sports world everyone remembers the legends and presumes that if you think that way all the time you will win. But we all know this is not necessarily the case in reality. But everybody remembers the legends. Just like people forget about the predictions that didn’t come true, message receivers don’t remember the tricksters that didn’t come true when they were in message crisis. This particularly becomes true of negative trickster messages. Message receivers’ become overwhelmed because they believe in the accuracy of all negative predictors and this greatly affects their performance and social agency. Negative tricksters become more real than ones trust for other human beings and often discourage activity and social agency. As a result projections of social decline, supported by institutional captivity and medication side effects, may become real. A potential exercise to counter the negative feedback loop is to ask the message receiver what percentage of the time their messages come true: 90%, good! Then ask them what percentage of their messages are positive in their eyes, what percentage of their messages are they grateful for: 10%, good! Though I believe the answer to these questions will vary and be challenging for the message receiver to ascertain, they will naturally cause the message receiver to consider the reality of tricksters and positive self-fulfilling prophesies in ways they usually don’t. Then, another exercise that may work if you have established enough trust with the individual is to examine examples of negative messages that came true and contrast them to stories when the negative messages didn’t. I believe that what you will find is much longer and more powerful stories about negative outcomes coming true in crisis and an inability to remember the ones that didn’t. Really nothing else matters to the suffering message receiver in crisis than the negative ones that come true. Point this out, along with asserting the definition of tricksters, and you may undermine the ethos that is doing the message receiver so much damage. These types of exercises can be used to acknowledge both the reality of tricksters and the need for positive self-fulfilling prophesy. In essence, you want a message receiver to always work with a positive self-fulfilling mindset and learn to accept, be humble, and persist when they don’t get what they want. You want the message receiver decrease the affair they have with giving their power to trickster messages—positive messages (real or magical) are fine—and help them adjust to the material world so they can find a place that in the classroom of Muhammad Ali clones that fits their natural abilities and inclinations. In my days of hearing voices, they were indistinguishable whispers. My intuition was that they were about me and were bad. Finally, after many bad ones, I got a skilled therapist. She told me that the voices indicated I needed to work on current rejections in my life. When I did this they tapered off, finally to zero. Not all voices are good or bad, and as you’ve mentioned, it’s often hard to tell if they are good or bad. I’m reminded here of research on affirmations in which the disappointment of not achieving them was worse than having no affirmation at all. What happens when these self-fulfilling positive voices just do not materialize into anything? Thank you, your question will help me with other parts of the chapter. I think affirmations need to be flexible and address human needs primarily. They can pursue wants, but if needs are being met, gratefulness for needs being met can soothe that desire. I realize this issue may need to be brought up earlier in the chapter as a result. As a writer, I have had a fundamental need to write. I write to be read and want to be read, but that part of the deal is up to higher powers. It’s true that I battle with a sense of invisibility that hurts, but then I have to adjust my prophesy so that my needs get addressed and my wants reside where they need to, under higher powers. A sense and acceptance of limitations is necessary for self actualization and health. I think famous sports achievers have to battle enormous obstacles and they have ups and downs too.